Alle Preise verstehen sich in Euro einschließlich der gesetzlichen Mehrwertsteuer. 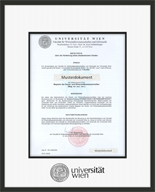 High quality anodized aluminum frame, in a satin black finish that comes with a white over black double mat board, with the University of Vienna logo embossed in black. Fits the A4 size Diploma.